One of our programmers (me ) has a development blog which talks about all kinds of things around development, including stuff about Swords & Soldiers. The newest blog post talks about how the settings system for Swords & Soldiers work. If you are interested in how games are made, this may be a nice read. I wrote another blogpost about the development of Swords & Soldiers. This time about how we designed levels without having the time to create real tools for that. 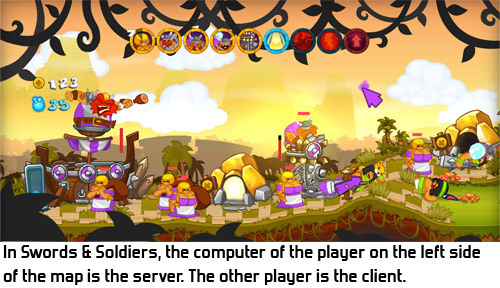 New blogpost about Swords & Soldiers development! With more interesting details on how our AIs work, and an image of the insane size of the Chinese skirmish AI. Another thing which came very late was the actual balance between factions. Halfway through development, we had the impression that the balance was okay, since we did a few basic balancing sessions at the start. But by the time the campaigns were nearly done, we decided to take another hard look at this balance. It turned out that the balance was horrible and would need a lot of work. Once we started investing in this work, it of course shook up a lot of the work on the campaign. Levels were suddenly way too hard, or too easy. This added another chunk of unexpected work. Needless to say, we learned a lot about the sequence in which we should design our games. It is a lot more complex than that. Ideally balance is finished before campaign development starts, but that can only be done in theory. In practice balance insights keep shifting throughout development, so balance is never finished.